SpeedisExpensive brings to the screen one of the most dramatic stories in automotive history – the rise and the fall of the Vincent motorcycle. These fast, revolutionary machines were produced by eccentric engineer Philip Vincent and his small team in war-ravaged England. Yet, just months later, the company pulled out of the motorcycle market. The bikes’ creator, Philip Vincent, never designed another vehicle which would go into production. He died in 1979 – the family fortune exhausted pursuing his obsession with speed. Today, high-profile riders such as Brad Pitt, Ryan Reynolds and Jay Leno revere the bikes. Racing models fetch $1 million at auctions and in private sales. But SpeedisExpensive is more than the story of automotive endeavour. It is also a detective story, a search for family secrets and identity. The film follows Philip Vincent-Day, the 26-year old grandson of Philip Vincent who never met his grandfather, as he embarks on a journey looking for answers about his forebear’s amazing life and machines. He talks to the men and women who built the bikes; racers, friends and family. He learns how Vincent and his workforce built such revolutionary motorcycles and the secrets behind the bikes’ amazing performance. And he discovers how the fate of the company turned on a bizarre accident on a wind-swept airfield near the factory in the winter of 1948. Our journey of discovery is transformed by a wonderful find – in his mother’s garage – of a rich colour and black white collection of high-quality film footage shot by Philip Vincent himself, showing his private and professional life from the 1930s onwards. Today, Philip Vincent is seen as nothing short of a genius… the man whose frame designs the Japanese would borrow years later; whose Black Shadow model remained the fastest motorcycle the public could buy right up until the early 1970s. Now, through a young man’s journey of personal discovery, the full story of the pioneer who changed motorcycling forever will be told. Between 1935 and 1955, the small Vincent-HRD concern produced its own hand-built motorcycles following a new and profoundly novel design. To buy, each one cost the equivalent of an average worker’s yearly wage. The firm’s Black Shadow, a stunning 1000cc V-twin finished all in black, was capable of 125 mph out of the crate in 1948. Fast, ground-breaking and avant garde – speed records soon fell to the factory. In 1948, American Rollie Free smashed the 150 mph barrier on the Bonneville Salt Flats – clad only in swimming trunks, for reduced wind resistance. In New Zealand in 1955, Russel Wright upped the motorcycle speed benchmark to 185mph. Unofficial speeds of 200mph were recorded. The man behind it all was Philip Conrad Vincent – a true maverick, a man in a rush – who walked away from his studies at Cambridge University to build his ground-breaking motorcycles aged just 19-years old. But just as his machines were beginning to set the world alight in the post-war period, a serious accident testing a Rapide model of his own design left him in a coma for months. The extent and consequences of his injuries have never been fully revealed – until now. Today, his bikes are sought after by collectors around the world. In 2011, Rollie Free’s record-setting Black Lightning sold in California for around $1 million. And in January this year an Australian record-setting Lightning was sold for just shy of $1 million at the Bonhams auction in Las Vegas. Philip Vincent – a man who ‘made wonderful motorbikes, but never any money’ – paid a high price to realise his dreams. Was it worth it? Did he regret his single-minded pursuit of building his motorcycles, at the cost of so much? Our film provides the answers. ‘Speed is expensive,’ he would say. SpeedisExpensive is told, in part, by those who were there – the people who built the bikes, who knew and worked with Philip Vincent and his gifted co-designer, Phil Irving. The surviving factory veterans relate how, against the all the odds, motorcycles ‘built like Grand Prix machines’ were produced from a leaky factory with antiquated equipment. American record-setter Marty Dickerson tells us how his street racing in 1940s America – including a victorious drag race with motorcycle cops – helped make the 1000cc Vincent the most talked-about motorcycle in the USA. The late John Surtees – in his final major interview – goes into candid detail about his career as an apprentice at Stevenage; his heroic efforts to help win speed records at Montlhéry and how his father foresaw the early demise of the company. Motorcyclist, artist and musician Paul Simonon talks about his love of the bikes – ‘works of art, moving sculpture’ he calls them – and how Joe Strummer came to include them in a Clash song. 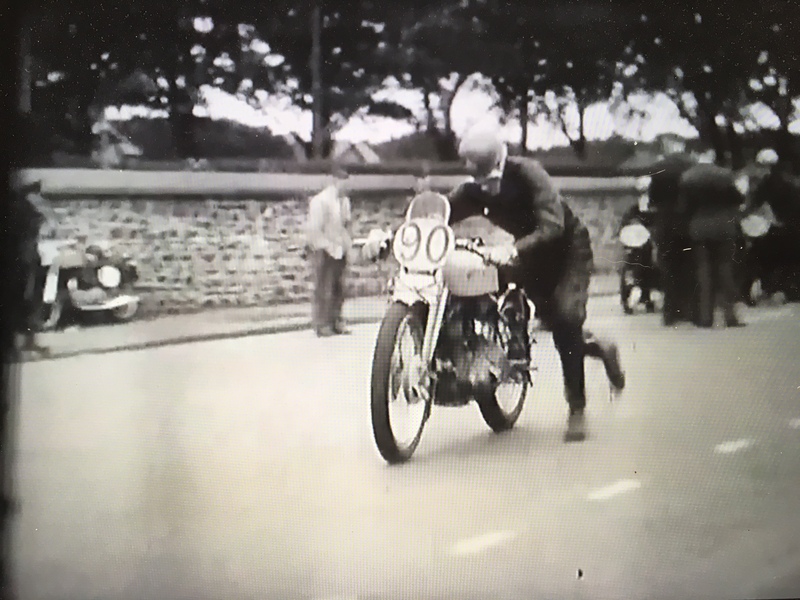 And celebrated sculptor Jeff Decker describes the men behind the bikes as ‘geniuses… automotive designers who hit a home-run’ – and lifts the lid on Rollie Free’s amazing world record run in 1948. The picture of Free at 150mph, clad only in swimming trunks, has been called ‘the most iconic image in motorcycling’. Vincent emerges as a brilliant, smooth-talking evangelist for his ground-breaking motorcycles, but someone whose dreams out-stripped the reality of business at nearly every turn. The documentary has the full support of the Vincent family, giving access for the first time to some 20 hours of footage shot by Vincent himself in the 1930s, 40s and 50s. Now fully-restored, this priceless archive chronicles Vincent’s private life and international travel as well as the factory’s ground-breaking entry to the 1935 TT and record-setting visit to the Montlhéry autodrôme near Paris in 1952. The footage is supported by unseen photographs, factory drawings and Vincent’s own extensive volumes of press cuttings from around the world – plus hours of audio recordings of Vincent and co-designer Phil Irving being interviewed. Like so much of our film footage, these have never seen the light of day until now. 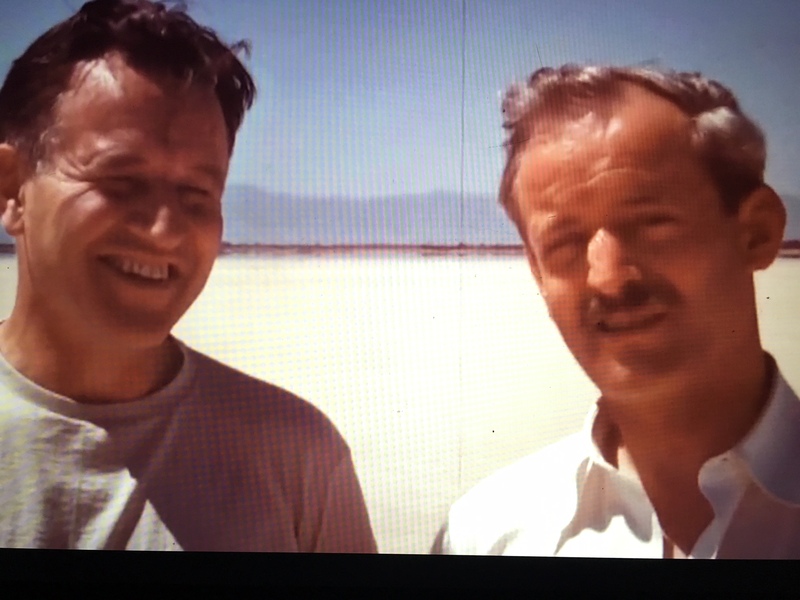 Period film sourced includes professionally shot high-speed testing on public roads in 1947 and the upping of the new world land speed record of 185mph in New Zealand in 1955. Movie footage featuring Vincent motorcycles extends from the 1957 BBC feature of Orwell’s 1984, in which the Thought Police ride the sinister, fully-faired Series D models, through to the opening sequence of Batman Forever. Vincent motorcycles were the bikes to beat in speed record attempts and sprints right up until the late 1970s and early 1980s. Riders such as Brian Chapman in the UK, and Jim Leineweber on the Barn Job in the USA, pushed the boundaries of terminal speeds and quarter mile times. They were following a fine tradition: from his first races for the factory in the late 1930s and then as an independent racer, George Brown led the way in sprints and speed records in the UK until the late 1960s. His supercharged Super Nero was unofficially clocked at 200mph. The Clem Johnson-built and tuned Barn Job, with a supercharger fitted, reached over 185mph. In the mid 1960s, Swiss Vincent enthusiast Fritz Egli saw the same potential. Seizing the National Hill Climb Championship in his home country on a modified Black Shadow, Egli refined his bike – keeping the oil-bearing top frame design – to became one of Europe’s most beautiful motorcycles when launched in 1967. The Egli frame gave Vincents a new lease of life, with examples winning races up to the 1980s, against much more modern competition. Today, Frenchman Patrick Godet builds sublime recreations of these bikes, dubbed a ‘design and performance tour de force’ by racer and designer Nick Ashley. In Australia, where co-designer Phil Irving returned to in the late 1940s, Vincents came to dominate the country’s sidecar speedway racing. The Jack Ehret bike, above, took the country’s land speed record outright in 1953, reaching over 141 mph on a closed public road. In the mid-1960s, Irving co-designed the Repco Brabham V8 engine – making him the only person to be be responsible for a world record-setting motorcycle and Formula 1 winning engine. His mantle has been taken up by brothers Ken and Barry Horner, who knew Irving in his later years. Building on the great man’s work on top end tuning, their Irving-Vincent race bikes stunned racers and fans of the marque, taking wins at Daytona and on home circuits. The word ‘genius’ can be over-used. And so much added to the brilliance of the 1000cc Vincent HRD; the Stevenage factory was peopled by those at the top of their game – engineers, racers, road-testers, draughtsmen and women. But perhaps most of all, it was having two brilliant minds, Vincent and Irving – we think geniuses – working together, seamlessly, on one project. What is not in doubt is that no other automotive unit, whose DNA can be traced back to the 1930s, has sustained such impressive and successful development, which continues to this day. The search for the untold story of the Vincent has taken our film crew across the UK, to France, Ireland and the USA. In July, we gained access to the former Vincent Works in Stevenage – an historic site, which is remarkably well-preserved – where we shot interviews with factory workers and the close family of Philip Vincent himself. Further shoots will take place in Europe, the USA and Australia later this year, wrapping and adding to our story with stunning action footage of the most significant Vincent motorcycles in the world. David Lancaster: Director & Co-Producer David began work on SpeedisExpensive four years ago. Formally the motoring editor of the Times (London) he regularly contributes to the Wheels and Waves and The Vintagent websites. David wrote the introduction to the 2016 book of Paul Simonon’s motorcycle themed paintings, Wot No Bike? and has contributed to publications The Drive, The Ride 2nd Gear and Paul d’Orleans’ Café Racers. He has been a researcher, director and script-editor for both Channel Four and the BBC, including automotive series Ride-On and Top Gear. Steve Read: Director of Photography & Associate Producer Co-director of Gary Numan: Android in La La Land (BBC4 broadcast and general release 2016) Steve was also director of photography on BBC4’s 2017 flagship two-parter, The Summer of Love: How Hippies Changed the World and on Elvis: Rebirth of the King. His directorial debut, Channel Four’s Knockout Scousers, was broadcast in 2012. Variety dubbed his Android in La La Land a ‘slick music documentary’ – Rolling Stone magazine called it a ‘must see’ film and it gained a 4/5 star rating from the Guardian. Gerry Jenkinson: Co-Producer Like David Lancaster, Gerry has been a Vincent owner for over 30 years. His career spans music, video and theatre, the latter as lighting director to Sir Peter Hall and Harold Pinter in London, New York and Moscow. Gerry has directed several short films of record-setting at the Bonneville Salt Flats, featuring Max Lambky’s twin-engined Vincent and the world’s fastest battery-powered motorcycle, Eva Hakansson’s 270mph KillaJoule. James Salter: Producer (USA) A highly experienced media professional, James has undertaken musical and production work for clients such as Netflix, Sony and The Evergreen Stage in Burbank. He is the secretary of the Southern California section of the Vincent HRD Owners Club. Mike Nicks: Associate Producer A former editor of Classic Bike and Classic Racer magazines, Mike has covered MotoGP racing for the Guardian, the Observer and Independent newspapers. He is the co-author of John Surtees’ autobiography, My Incredible Life on Two and Four Wheels and executive producer of the 2017 documentary John Surtees: One of a Kind, for Yesterday TV, broadcast September 2017. Alan Thomas, ASA: Finance Director A partner level accountant, Alan has vast experience as an entrepreneurial director steering media launches. He is the former Financial Director of London’s Metropolis Studios, raising funds and managing its documentary arm. The family of Philip Vincent Vincent’s only daughter, Deirdre, grew up close to her father; firstly in Stevenage and then London, witnessing first-hand the highs and lows of his career. Her former husband, Robin Vincent-Day, is an expert on the marque and assisted Vincent during the 1970s to develop his rotary-engine project. Their son, Philip Vincent-Day, preserves the archive and heritage of his grandfather and his motorcycles. He is an Associate Producer of SpeedisExpensive. Dr Andrew Nahum Andrew is the former Principal Curator of Technology at the Science Museum in London, an active Vincent rider and now Keeper Emeritus at the Science Museum. He was responsible for the museum’s exhibition Inside the Spitfire, director and lead curator for its Making the Modern World gallery and this year curated the Design Museum’s acclaimed Ferrari: Under the Skin exhibition. His books include Issigonis and the Mini and Frank Whittle: Invention of the Jet. Godet Motorcycles Frenchman Patrick Godet is one of the world’s leading experts and restorers of Vincents. He is the only builder of the famous Egli-Vincents sanctioned by Fritz Egli himself. His collection of bikes, and immaculate atelier near Rouen, will be used for action and assembly footage for the final filming of SpeedisExpensive.